Food safety is important for everyone, but it’s especially important for older people. As we age, our bodies undergo changes that make us more susceptible to foodborne illness or food poisoning. 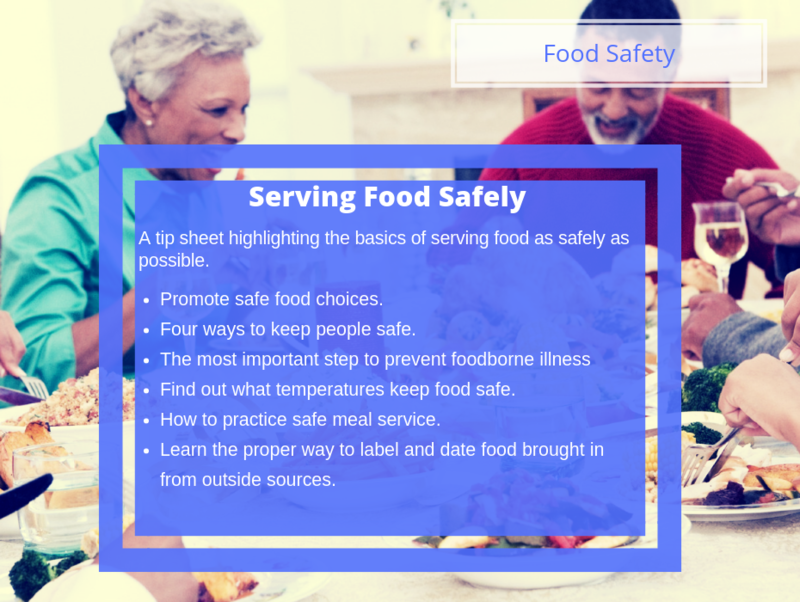 Since foodborne illness can be serious, or even fatal, especially to older people with compromised immune systems, it is essential for people working in long-term care communities to know and practice safe food handling to help reduce the risk of people getting sick from contaminated food. While people in dining services do their best to offer residents foods that they enjoy eating and hope people will feel comfortable enough to ask for something that isn’t on the menu if they want it, they must also realize that at times, residents and their families or visitors may wish to bring in food from outside sources. This is a good thing since such meals or snacks are likely to be foods that the resident really loves eating. However, for their safety and well-being, residents need to be made aware of the risks involved with bringing in perishable food items. Proper handling of the food and the leftovers is essential to ensure the food is safe for people to eat. Here’s a quick refresher about safe food handling when people bring in food or storing snacks.